Privacy is hard to come by in many neighborhoods around our area but we've got a solution for that! Plan your own private paradise this fall. It's the best time of year for planting trees and shrubs that will create a sense of natural wonder and privacy in your yard. Your landscape doesn't have to goto shambles in the winter. No need to think it's all dead and gone. The Fall season is actually the best time to plant trees and shrubs to maximize growth and color. Take a look at just a few of our featured evergreen trees and shrubs that stay colorful all year long. Not all flowers are created equal. We're not just talking about size, shape and color. When it comes to flowers that will stand the test of time, there are only a few that thrive once they're cut for floral arrangements. And come Fall, the pickings are even more slim. But, we've got good news! These eight Fall flowering plants are perfect for any cut flower arrangement and we carry them all at GSCO! There is no greater gift we can give ourselves than the flowers we pick from our gardens. And while we love to gaze at them outdoors, the dog days of summer are here and that means it's time to–snip-snip–take them indoors! Try these simple steps when cutting your fresh floral arrangement for maximum viewing pleasure! No need for a bird call, we've got three flowering perennials that are sure to attract your feathered friends to the yard. Try one or all three! Cucumbers are best straight off of the vine but no need to let the extra cukes go to waste if you can't eat them all while they're fresh out of the garden. When life gives you cucumbers, make pickles! Try this time-tested recipe from Anna–one of our gardeners! We think you'll love it. The dog days of summer are here, the North Carolina humidity is kicking and it's time to get out of the outdoors and off on your vacation. But as your well-awaited time away approaches, perhaps you're thinking you want to bring the outdoors in with an oasis of house plants. No need to sweat it out in the garden and there's no need to wait until after you get back from your week off of work! There are plenty of easy-care, indoor plants that are vacation-proof. Lilies are some of the most prized blooms we find in our gardens each summer season. It's hard to pick our favorite of the thousands of varieties of lilies out there so we've narrowed it down to our top five lily varieties of the summer. Mosquitos have headlined the news for months due to the Zika virus outbreak. While there are shelves full of chemicals to repel those pesky insects, there are also many plants we can add to our gardens to detract mosquitos. Using citronella as a mosquito deterrent is common knowledge, but did you know that these six plants repel mosquitos too? It's SPRING! And it's about that time of year when we await those seeded, green berries to transform into sweet, ruby jewels. When your berries are ripe and ready, try this garden to table recipe in the kitchen. We think you'll fall head over heels! Who doesn’t love seeing tiny, jewel-toned hummingbirds gracing their gardens? If you want to attract more to your yard, follow these five, easy steps and you’ll soon find hummingbirds fluttering all around your garden! There's a lot of buzz about beekeeping these days. Keeping bees has become popular among many gardeners in the US. So why should you think about keeping your own colony? March is here and you know what that means! It's time for spring cleaning. Now that the winter weather is fading away and the forecast is looking sunny, you might as well start your spring cleaning outdoors. Save that closet cleaning for later! March is the best time to prune all of your trees and shrubs except those that are spring blooming. So skip the azaleas, cherry trees, quince, forsythia, pear trees and other spring bloomers and get those pruning shears out for all of your other trees and shrubs. Do you see where the trunk meets the branch? This is called the collar. Cut just above this area on your tree branches at a 45 degree angle. Begin with your tree's branch stubs (1) And damaged branches. Does your tree have a few of those funny-looking branches that shoot straight upwards? These are water sprouts (3). They can take excess energy from your tree, so these should be pruned out. Now, check out the bottom of your tree. Do you notice any suckers (4)? These are branches that shoot up beside the trunk. Prune these to keep your tree looking nice and clean. Take a step back. Do you notice any closely spaced branches (5)? Prune these branches so that they're not so close together to promote even growth and appearance. Last but not least, you'll want to look for weakness. Branches with a narrow angle between the branch and the tree (6) are generally weak and should be clipped. Still have questions? Make a visit to see us or fine out more about our landscaping services here. We can save you the trouble of doing it yourself! Do you have lettuces growing in your cool season garden? If so, we've got the perfect recipe for you straight out of one of our favorite catalogs–Seed Savers Exchange. If not, swing by! We have plenty of seed and seedlings. We’ve previously put up a post on Fire Pit Fun where we talked about the many exciting benefits of fire pits. 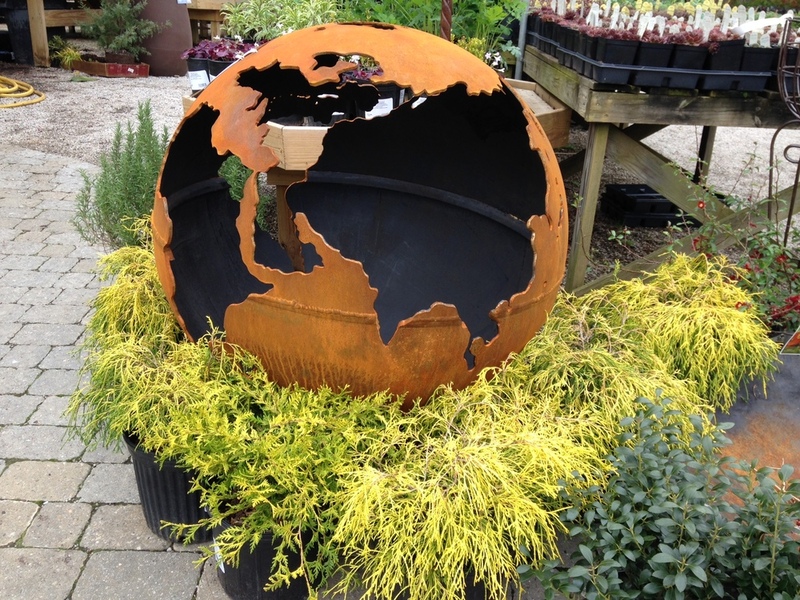 If you’re interested in fire pits, we have a selection right now from Rick Wittrig from FirePitArt.com. Rick lives and works out of Tennessee making beautiful functional steel art of high quality. If you’re thinking of getting a fire pit, check out the pieces we have because they make a statement, are built to last, and would be the perfect outdoor gathering spot for your friends and family! This tree grows up to 20 feet tall and can spread as much as 12 feet. It has a unique blueish color and grows in a graceful drooping pattern. It is slow growing with a low canopy, and can live for 80 years or more. This tree is an eye-catching addition to any landscape. It can grow up to 35 feet tall with a 5 foot spread and takes on a conical shape with branches that curve downwards. This is an extremely dwarf selection that grows 36 inches tall and only a few inches wide. Foliage is compressed on irregular, stubby branches and evergreen. This evergreen plant is upright and narrow with twisted growth. It is a great screen plant for a narrow hedge and is deer resistant. 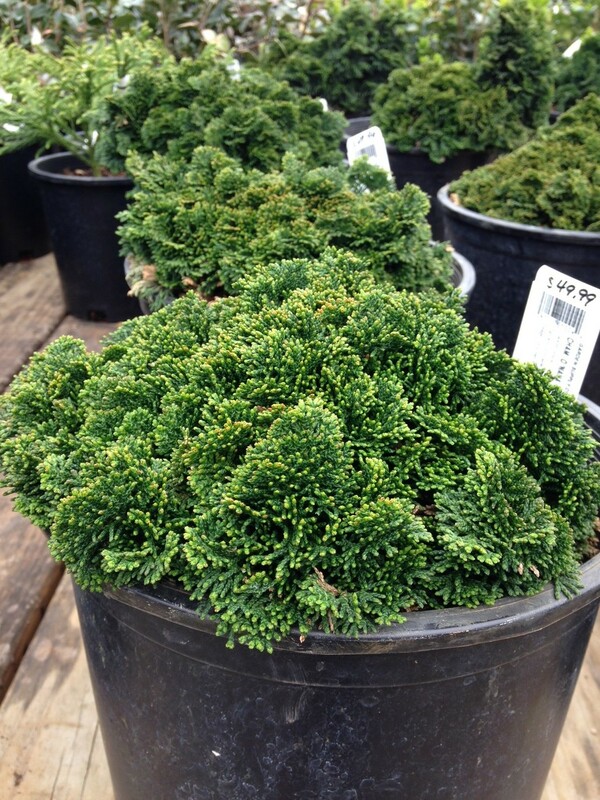 This conifer grows to 4.5 feet tall and 2.5 feet wide and likes full sun. 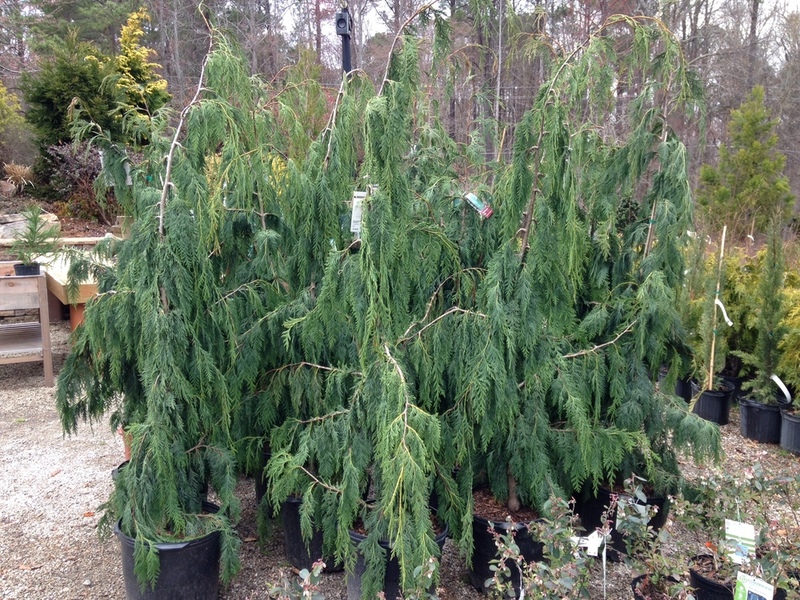 This is a dwarf hinoki cypress is an extremely dwarf conifer, growing 8 inches high and 12 inches wide. The bright green mounding foliage creates interest in any season. It likes full to part sun. 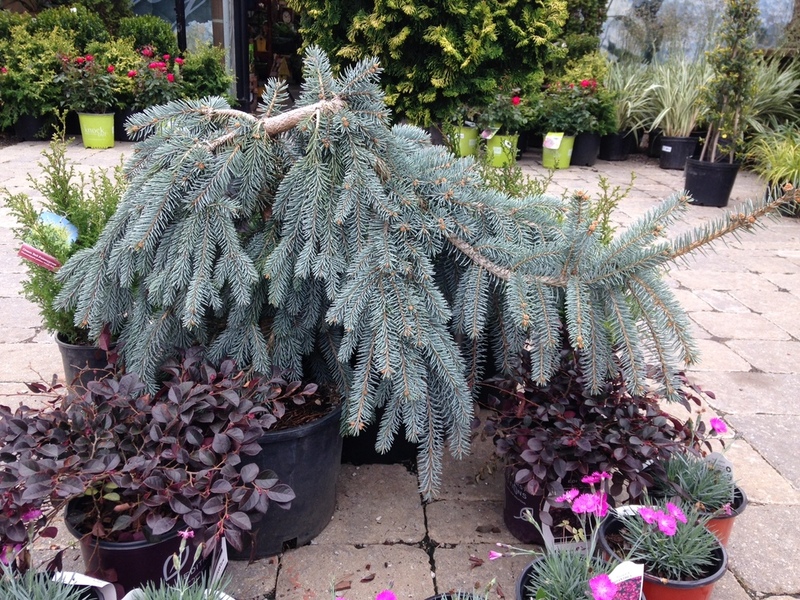 Soft textured silvery-blue foliage on this specially pruned conifer give it a unique look. To keep its shape, pruning is needed. This is a hardy tree that thives outside in the sun and is very ornamental. It grows in an irregular but mostly conical shape that can get up to 25 feet tall and just as wide. This conifer has beautiful bright golden-yellow foliage and is conical growing. It reaches 20 feet tall by 8 feet or more wide and full sun is needed for best color.